Home » Balloon that you can swallow? 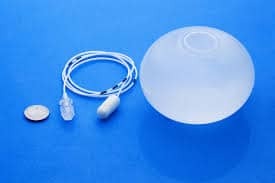 This bio-degradable balloon is an exciting new development in the field of weight loss surgery. It is packaged into a small pill which can be swallowed. A quick Xray check is performed before gently inflating it with saline through fine tubing. Your practitioner then pulls the tubing leaving the balloon to sit inside the stomach. It self-empties approximately 4 months later and then passes out naturally. The action of gastric juice on a special part of the membrane erodes it within the approximate timeframe. There is no requirement for surgery, camera endoscopy or anaesthesia and the whole procedure takes approximately 15 minutes to perform. You are able to return to work and normal activity soon after.